It’s Earth Month and I have been especially committed lately to reduce my plastic and general waste. Plastic is a huge issue and as always, not enough is done or it’s simply not done fast enough! Soon there is going to be more plastic than fish in our oceans – can you believe that? Despite being cheap and convenient, plastic is one of the most damaging materials out there. 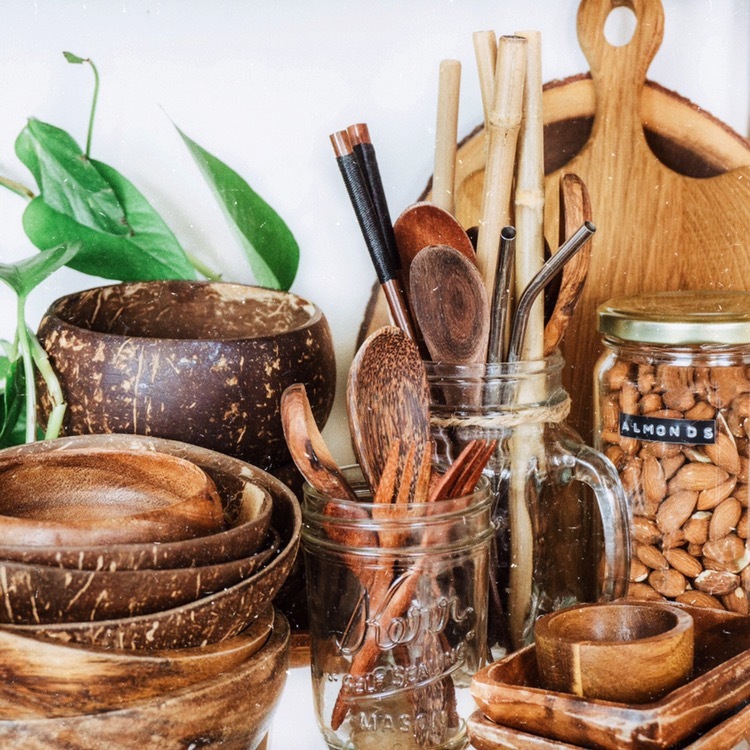 Hence, I thought I’d share with you my favorite 8 simple hacks to reduce plastic waste at home! They’re super easy, more durable, eco-friendly and worth every penny and second of preparation! Before I dive deeper into my favorite hacks, let’s take a closer look at the plastic issue for a second. It’s everywhere nowadays. 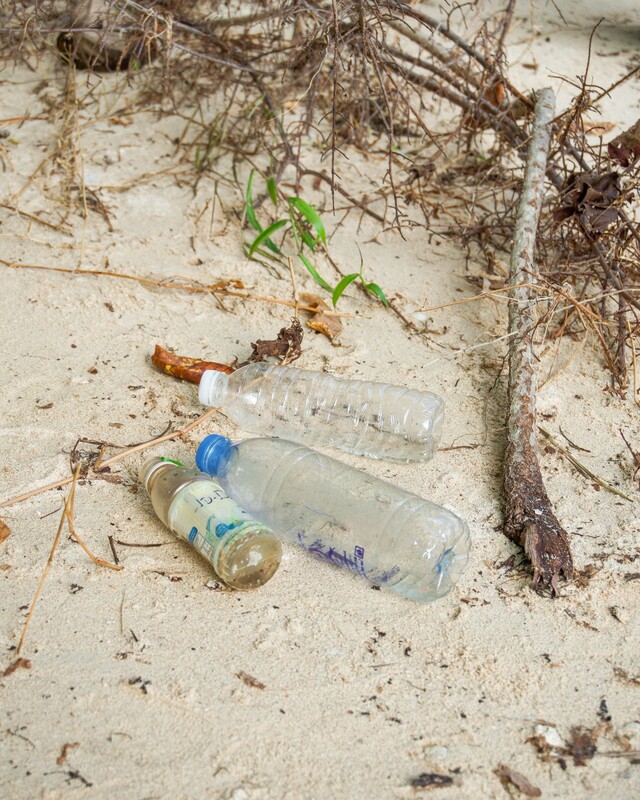 Almost anywhere where there is consumption involved, you’ll find plastic. Plastic bags, plastic bottles, plastic containers, plastic cutlery – the list is endless. Did you know that plastic takes about 500-1,000 years to decompose (research is still debating, but no matter what it takes a reaaaally loooong time)? The plastic bottle you drank from this morning, will most likely still be on this planet when your grand grand grand child is born. Just let that sink in for a second! We are polluting our planet without second thoughts, because it’s cheap, because it’s convenient. The plastic waste you see on your favorite beach or forest walk every morning is merely a minuscule fraction of the devastation. Plastic pollution is a global problem. It doesn’t stop at borders. While the EU and the UN have officially declared a war on single-use plastic, legislation is way to slow to keep up with our plastic consumption. In the meantime the impact on the planet and wildlife is disastrous. Creatures ranging from seabirds to turtles to whales, become entangled in plastic and drown or choke to death, adding on to the rapid extinction of some of these species. While effective laws government regulations might take decades to become fruitful, collectively, we must make a change. Immediately. The most effective way to do this, is to make small changes to your everyday life. Vote with your dollar. Research simple but effective alternatives. Participate in local clean-ups. Talk about the issue. Raise awareness. Pick up any trash you see on your outdoor adventures. This is not about perfection. 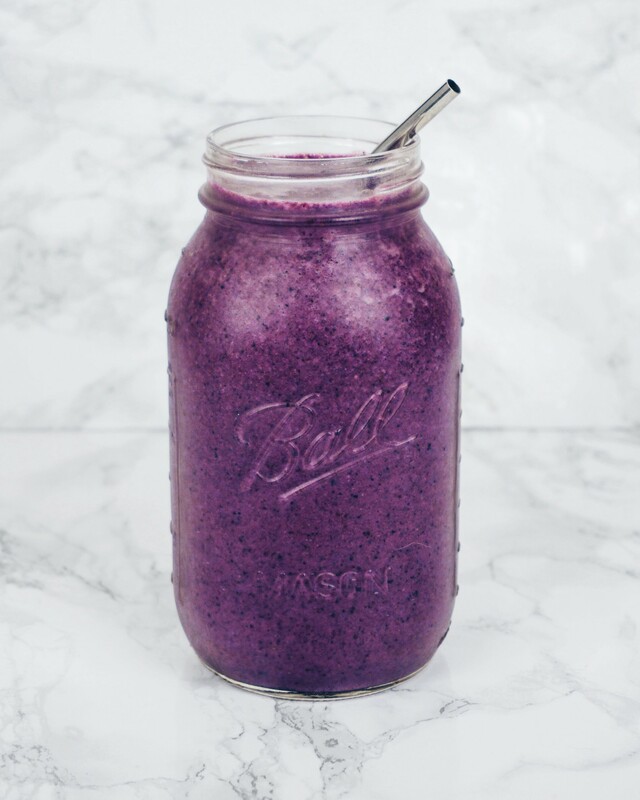 This is not about switching to zero waste living overnight. It’s about trying. It’s about taking small steps that are doable for you and your family. Like this, slowly but slowly we strive to improve our actions every day. If you don’t know about reusable wax wraps yet, listen up! I’ve tried my first ones about a month ago from a company called Wrappa and I’m in love ever since! 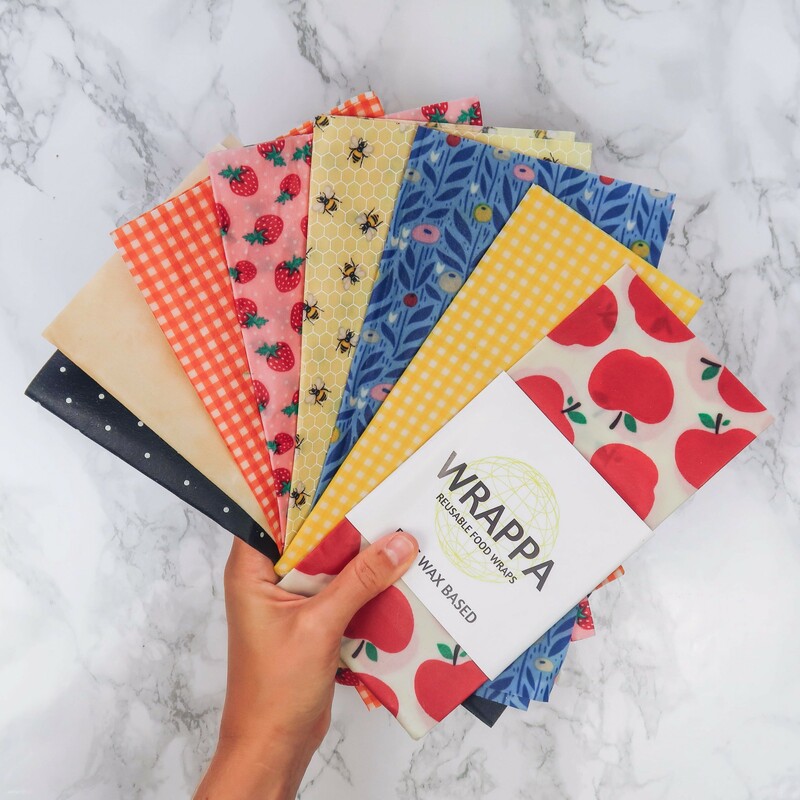 All the other wax wraps I could find out there were all bees wax based but my lovely friends at Wrappa offer both – vegan-friendly (made from plant-based wax) and normal bees wax ones! How amazing is that? They’re an Australian company with the cutest people behind and the prettiest designs! Best thing – they ship internationally! I got my wraps in a matter of a week and have been constantly using them ever since. Now, what exactly are wax wraps you might ask? 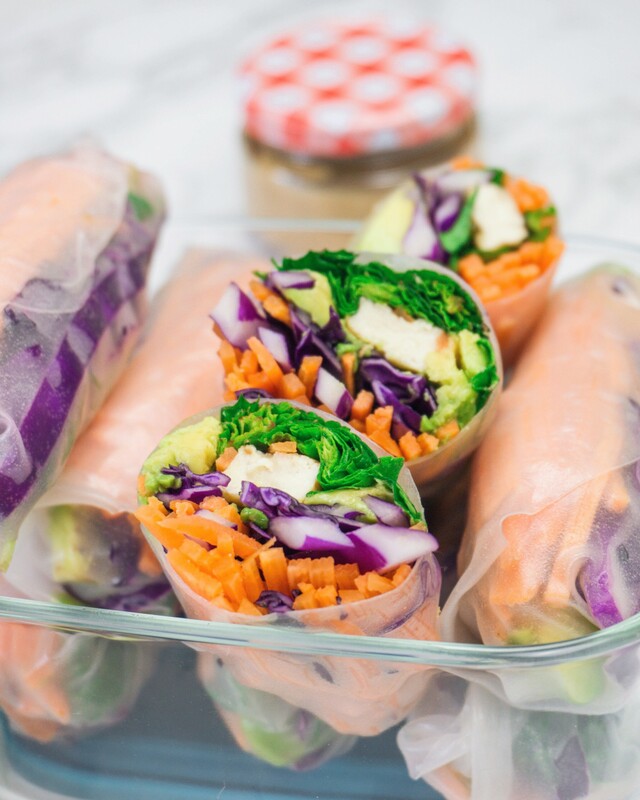 Basically they are an environmentally friendly alternative to a plastic wrap (e.g. cling film). They have multiple uses though and come in many cute designs so they’re a trillion times better! Wrappa crafts their wraps in South Australia using 100% organic cotton. 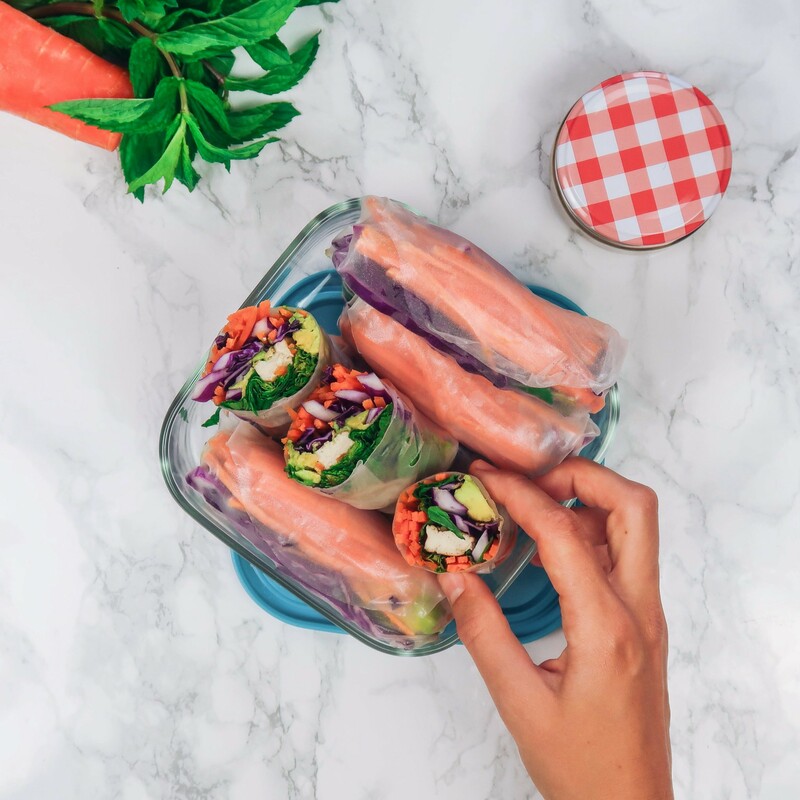 So far I’ve been using my wrappas for veggie and fruit scratches, as sandwich wraps, as a cover for bowls, and to make little snack pockets for dried fruit & nuts. They naturally smell amazing and the food odor is not transferred to the wrap, which is important (don’t want your cookies smelling like onion do you)! 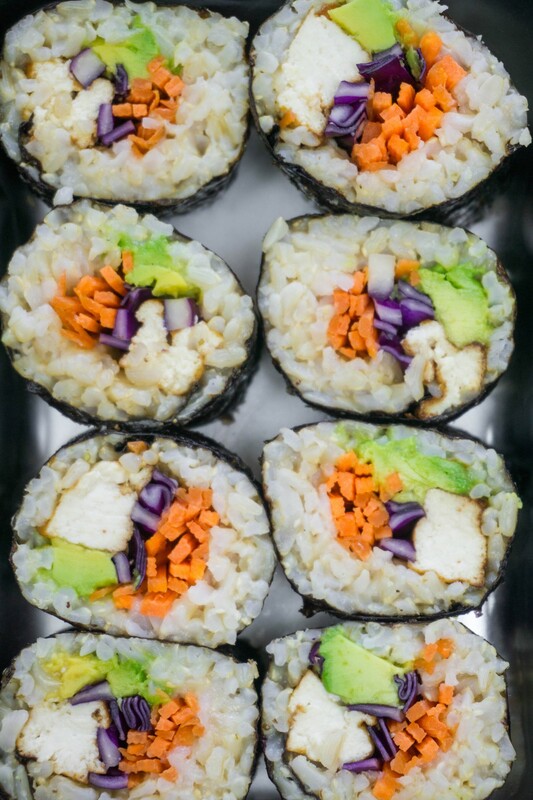 I’ve already convinced a number of friends to try them and they’re loving them! This is one of those products that I wish I’d have discovered years ago because it’s so convenient! If you want to learn more make sure to check out Wrappa on Facebook and Instagram or contact them directly via email for any questions! 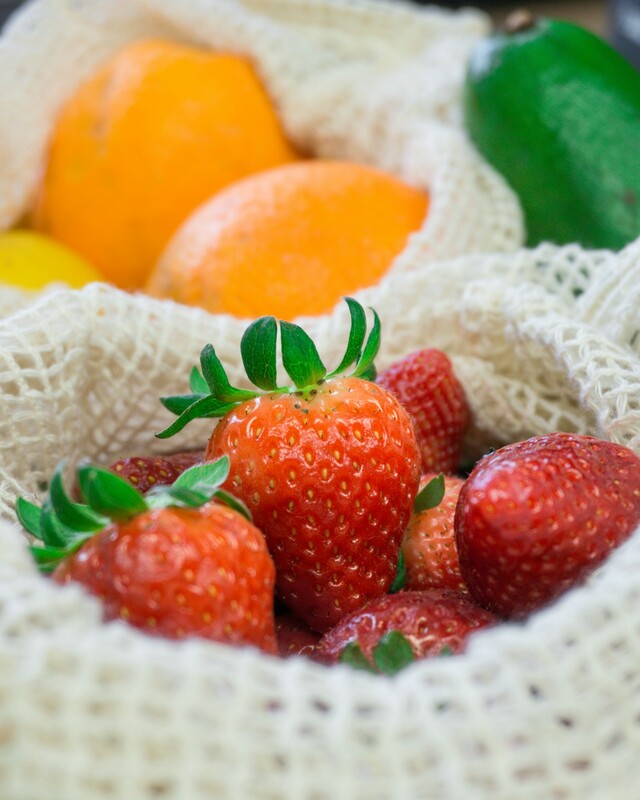 Here’s to another great hack that will drastically reduce your use of single-use plastic bags: cotton produce bags. Super handy, come in all sizes, pretty colors and last for a very long time! I ordered my first round of cotton produce bags on Amazon a few weeks ago and will probably order some more that are non-meshy very soon so I’ll always have enough! Here in Cyprus as in almost every other country, when you go grocery shopping you leave the store with an average of 10-15 plastic bags! They want every single fruit in a plastic bag or else the cashier will give you a mean look for making the cashier band dirty. Cotton produce bags are the best alternative for that! I’d advise to get around 10 in total, in different sizes and kinds (the mesh bags aren’t great for dirty potatoes as the dirt will fall through). 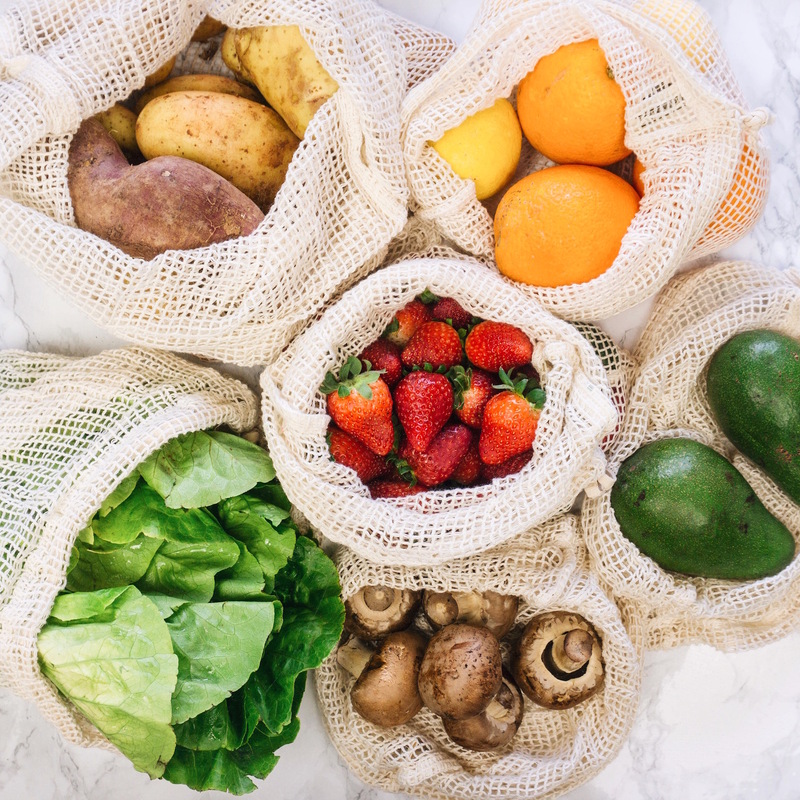 Like this, during your next visit to the local farmers market or grocery store, you won’t have to worry about those nasty single-use plastic bags anymore! You might earn a look or two for ‘being that hippie that brings her/his own bags’ but honestly who cares?! Most supermarkets already charge a few cents for the checkout plastic bags or sell reusable tote bags, so why not just bring your own! 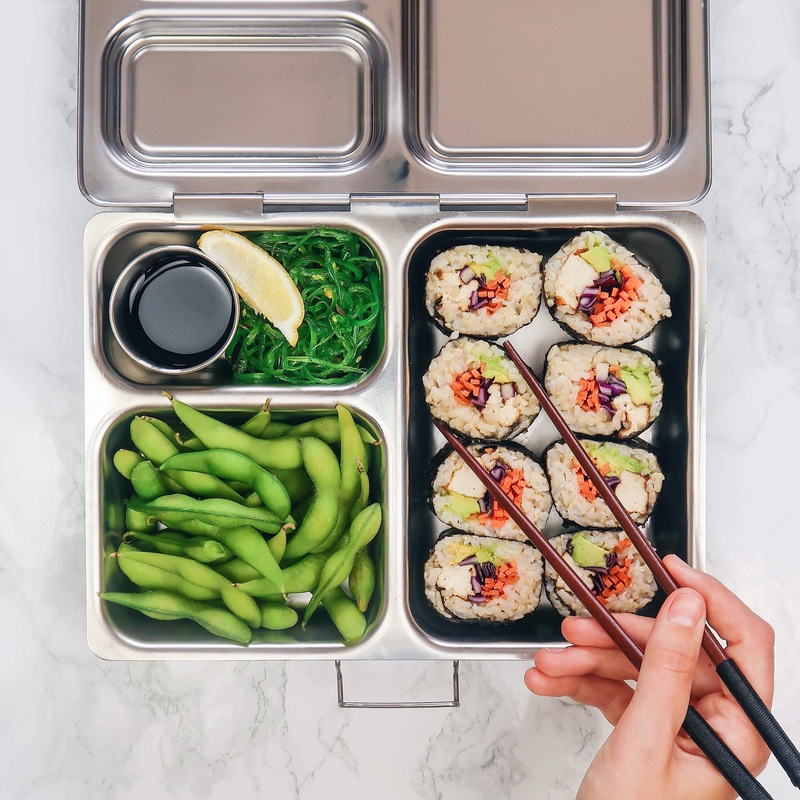 I’ve been looking forever for a light-weight, eco-friendly lunchbox alternative that I can bring to picnics, work or just anywhere and finally found a favorite: the Planet Box! I absolutely love the different compartments (they have one model with 3 and one with 5 different sections) and add-on sauce containers. I love the simple design and the many additional accessories, like a bag pack, water bottles, cold kits, etc.! You can choose between the simple version or various designs for magnets which is an adorable feature for families with kids. My boyfriend always has me worrying about plastic toxins leaking into our food so the planet box has that covered once and for all! It’s a great non-toxic BPA-free solution, which is easy to clean and built to last! If you’re still using aluminium foil or zip lock plastic bags you might want to have a look at this great hack! 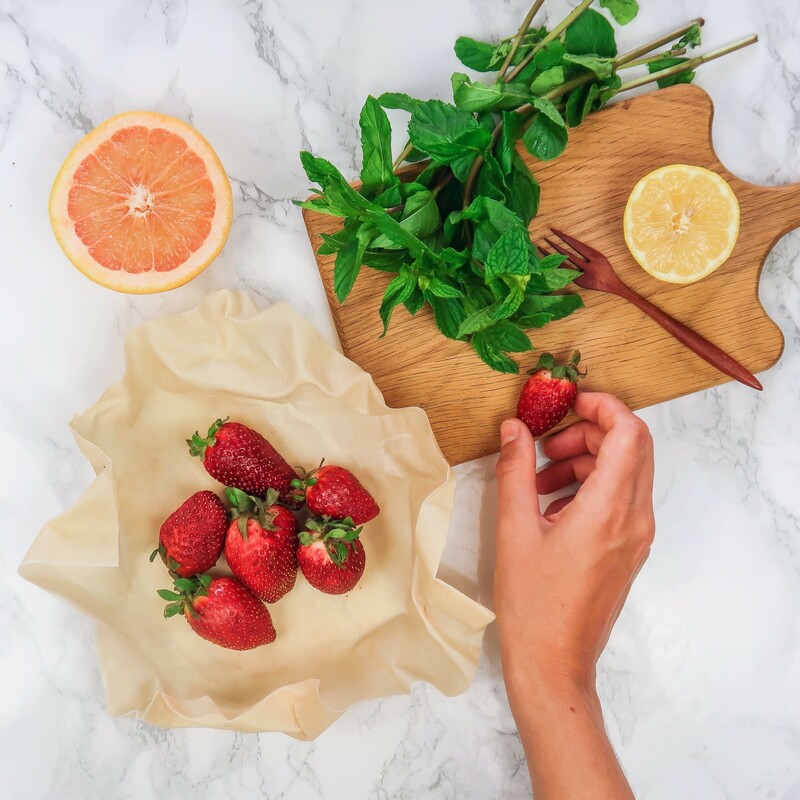 Stasher silicone bags are the healthier alternative to plastic bags and containers that have all the functionality of plastics with the purity of glass. They are the perfect self-sealing storage bags for anything from food to beauty products! 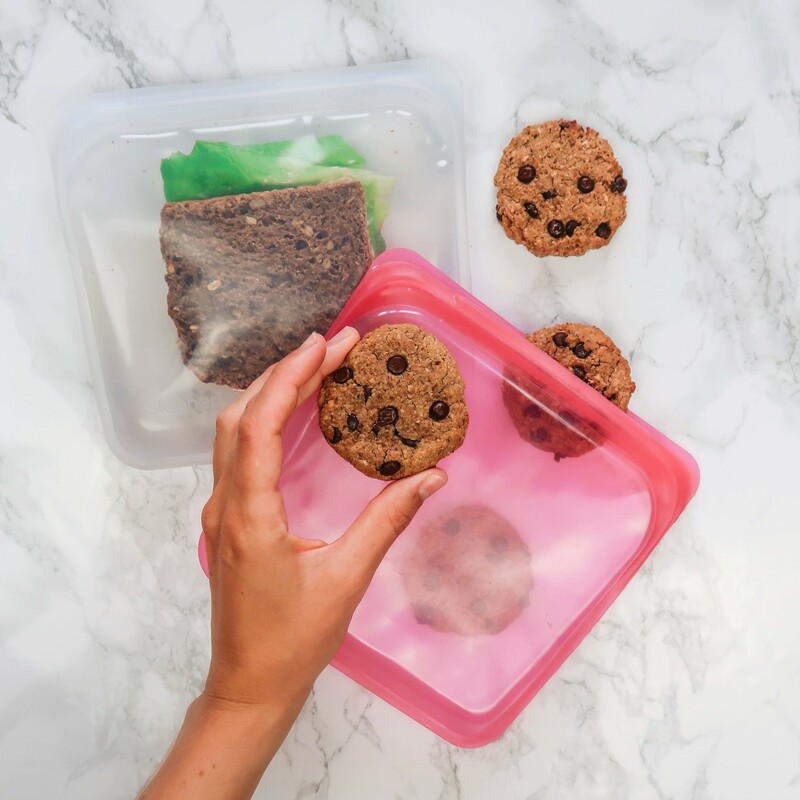 I personally use them to store my veggie scraps in the fridge, keep sandwiches and cookies fresh, and will also take them with me on my travels as they’re super versatile and easy to clean! Plus, they’re available internationally on Amazon and hence ship super quickly! Make sure to also check them out on Facebook and Instagram! I feel like this should be a no brainer since glass containers are around for decades but for some reason people prefer buying their plastic counter parts. 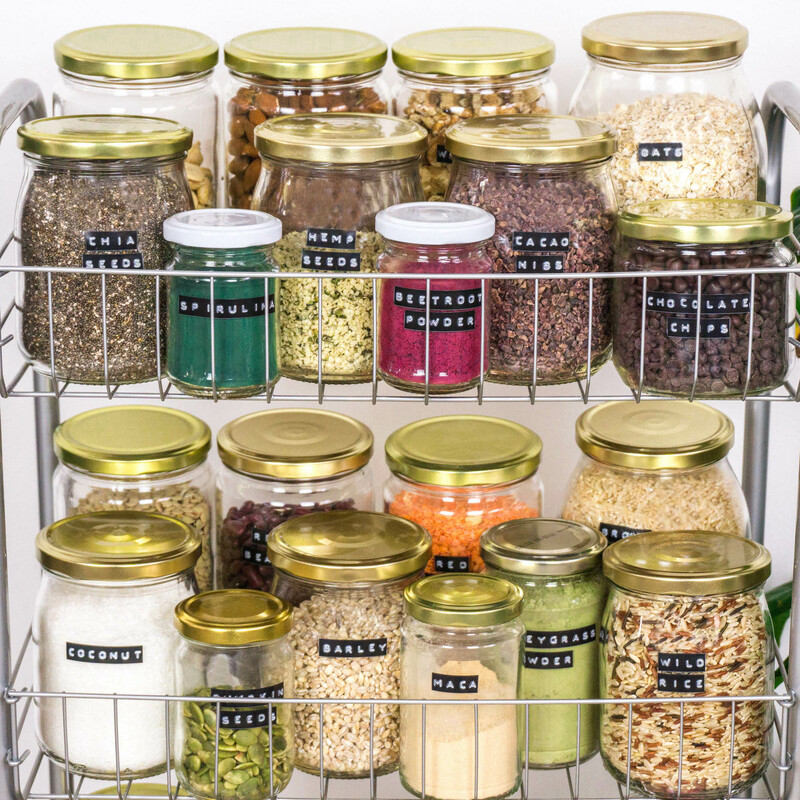 Especially for storing food at home these are so much better! Completely toxin-free, no scratches, no weird smells. I have been using glass containers for leftover food and small glass jars for dips and sauces for years and always prefer them over the plastic ones. 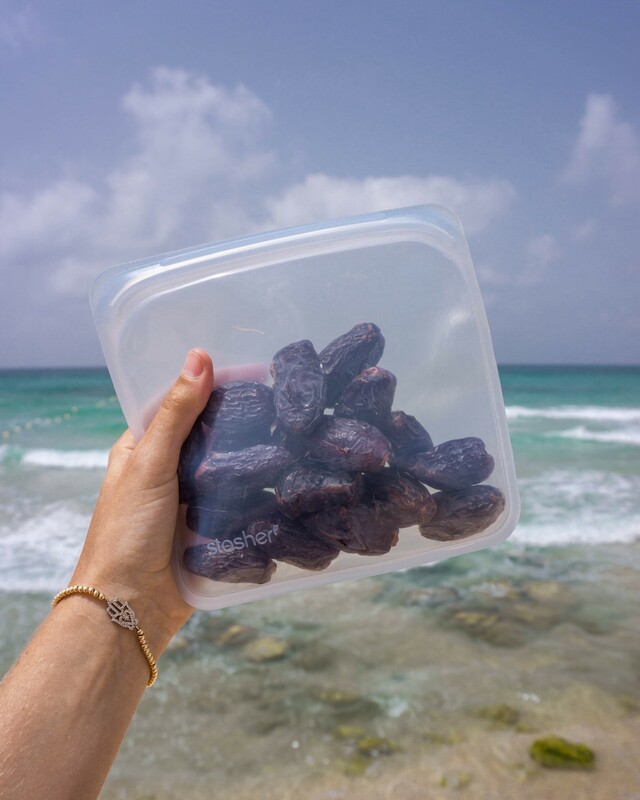 You can find them literally everywhere (Amazon) and they are oftentimes only a little bit more expensive than plastic containers, yet much more durable! This hack might not specifically refer to plastic but waste in general. I’ve recently upgraded all my dishwashing equipment to compostable, durable utensils and couldn’t be happier. Even my boyfriend loves those new alternatives! Gone are the times where that stinky yellow sponge was sitting next to the sink, being replaced once a week because it was so smelly. Did you know that those yellow sponges are made from petroleum and are 0% biodegradable? They shed micro-plastic into the water as they deteriorate and at best they last a few weeks. 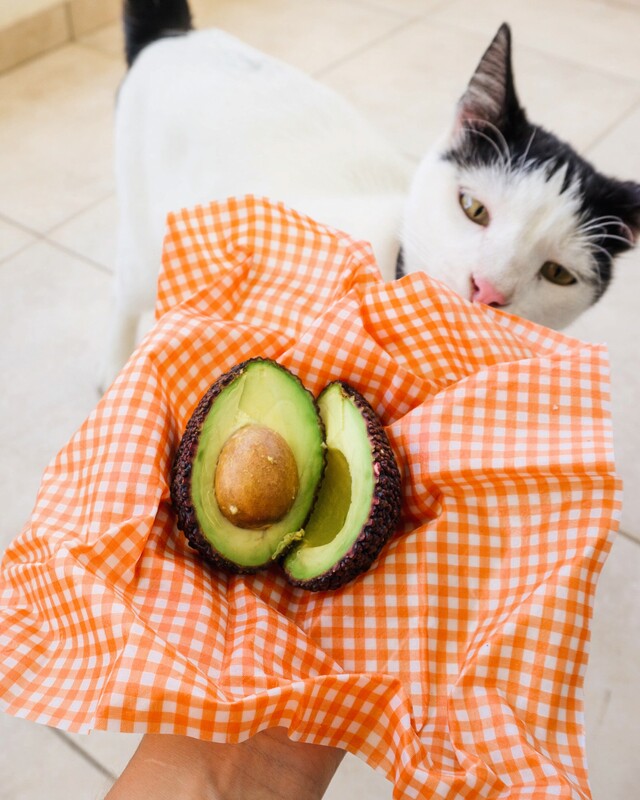 An ingenious alternative to that is the humble washing-up pad made from the loofah plant. When you get it it’s super flat and dry, but once it touches water it extends into this fluffy sponge, perfect for cleaning dishes. It’s super flexible, non-scratch, durable non-toxic, hygienic and quite traditional. You can find the Loofah online here. 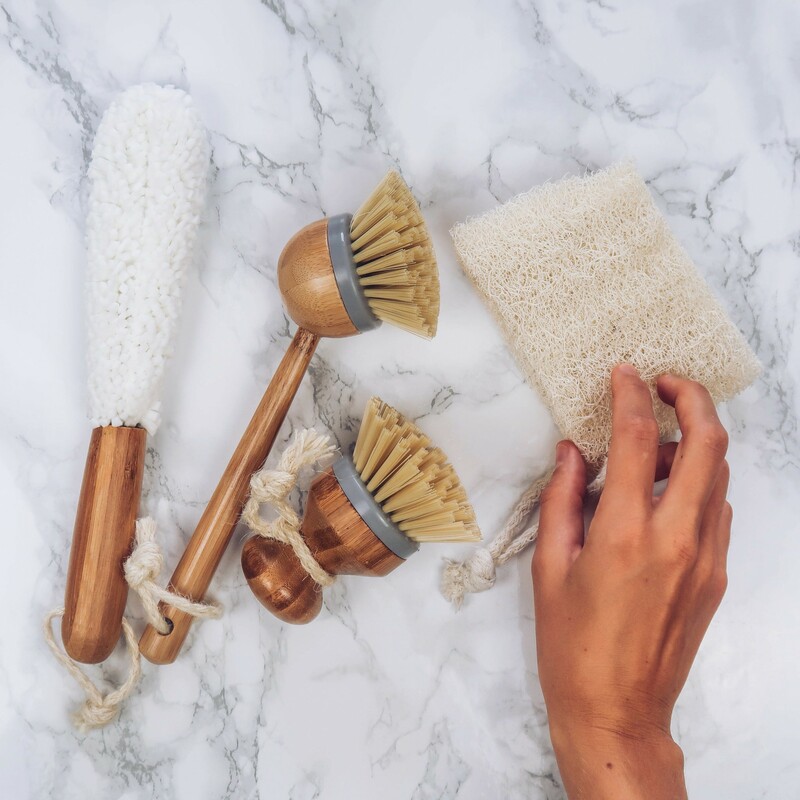 In addition to the loofah, I exchanged all my plastic brushes with wooden brushes and got myself a nice glass cleaner (perfect for mason jars and nut-mylk bottles), a palm brush and a dish brush. They’re much more durable, you can buy them with exchangeable heads and compost the afterwards! You can find them here!